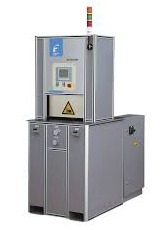 The ECOFLOW series machines are specifically designed for the small die maker or job shop owner. It is the ideal economical alternative for processing carbide dies for precise and repeatable surface finish improvement as well as short-run polishing and radiusing of surfaces and edges of critical components. ECOFLOW is the solution when there can be no compromise in edge and surface improvement conditioning. unreachable by any other means. Available with different size of media cylinders: 80mm (3.15“) or 100mm (3.8“). Flow rates are between 4,1 L/min and 6,5 L/min and pressure respectively between 207 bar (3000 psi) and 140 bar (2000 psi). Fully hydraulic with clamp system with interval of 250mm (9.8“). Equipped as standard with Siemens touchscreen HMI.